I'm awfully excited to be able to say that Brent A. Harris is now a published novelist. 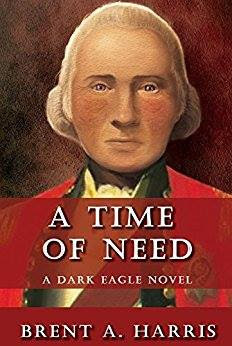 His book, A Time of Need, dives into a rabbit hole of alternative history, where George Washington is no longer the American hero we know today but instead fought for the British. 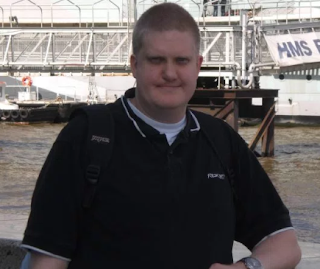 He joins us here at the blog for a chat about his book, delving into its creation. Hi Brent, and welcome back to the blog. For regulars here, you’ve obviously been a frequent visitor – but… you’re different this time. Now you’re a published novelist. Published. Novelist. How’s that title hanging round your neck? Feeling good? Hi! Thanks for having me swing by again. It’s a pleasure to be here. And about that novel business? It turns out writing your own book is much like finishing one you’ve read. There’s that cathartic moment, and then a bit of sadness and reflection that it’s over, and then the rush to crack open the next one. Okay, so let’s delve into the book a little. It’s an alternative history, for starters. What does an alternative history allow you to do that historic fiction doesn’t? Alternate history allows you to create a wholly new world that does not exist, much like Fantasy and Science-fiction. Historic fiction is wonderful, so long as you don’t mind being tethered to the world we are already in. I personally like to travel to worlds that never were, and that’s what alternate history allows me to do. You tell the tale of a world where George Washington fights for the British and Benedict Arnold marshals the American forces – beyond the research into the real figures, how did you feel you got to know them through the process of writing them as characters? What helped me understand the historical figures was to discover what motivated them. It’s arguably fair to say both Benedict Arnold and George Washington were motivated by ambition. In writing them, I knew I had to present them with as many challenges to their success as possible. I’m pretty sure if I ever met the fictionalized versions of these characters I created, they wouldn’t like me much. Particularly Stevens, the militia soldier caught in the middle of these two titans. He just wants a good ale and a decent game of dice. One of the things I really love about the book is the way the changes in the world aren’t just manifested through the leading figures but through those in harm’s way, the soldiers fighting for causes that may have shifted from those in the real world. I’m particularly fond of Stevens, and his journey through the book – tell me a little about the process of creating those characters and what role did you want these new characters to fill in the book? One of the things I wanted to show in this book is how regular people were affected by the changes in the new timeline. I wanted to show how the lives of Hessians, and Loyalists, and characters like Steven were inexorably altered, and how they then responded to it. I wanted to show that the past is also about people like you and me. That history, when the focus is on people, is story. How long did the process take – from first idea to printed book? And how does it feel now to have that book in your hands? The first seeds of the idea occurred decades ago. It was an exercise, a mind game to take out when daydreaming clouds passed by. The real beginning to the book happened shortly after my mother died several years ago. Life is short, and you can go unexpectedly. If you are not carpe-ing the diem, then life will pass you by. I’d begun writing since I was old enough to start scribbling stories, made a few false starts at novels, had read and studied the craft extensively, and had close to my million words of rubbish in the bank. It was time to set out and do it. It took four years of study, research, outlines, miserable rough drafts, miserable-er revisions, editing, sending out to publishers and agents, rejections (boo!) getting picked up (yay!) and then going through much of that process… again. But here we are, book in hand! So what next? Marketing, I presume? What do you do next now that the book is out? Are you on any other blogs or podcasts? Marketing is the sleeping giant you have to poke with a stick that they don’t tell you about when you start writing a book. You’ve bled your heart out doing everything from the previous question, now you got to sell it, sell yourself. You have to ask yourself, “Q&A for Altered Instinct, or work on a chapter of my current work in progress?” It’s time management, and it’s difficult, but doable, if you don’t like sleep much. Ultimately, what keeps me going is I’m excited to be sharing this book with all of you. So, thank you to all who’ve picked it up and have begun reading it! Now, confession time, Mr. Altered Instinct: I’ve been seeing other blogs. I hope you don’t mind. The best way to catch me with them is to Google “Brent A. Harris Alternate History.” It’s so easy to click. I’m sorry, I’m weak! Other blogs? Traitor! You're as bad as George Washington! Ahem. Okay, back on track. What is it about the era of the Revolutionary War that drew you in? This may sound strange, but the Revolutionary War is a period of history that people stop paying attention to shortly after discovering that Washington chopped down a cherry tree, and Paul Revere sold silverware. It’s an important part of our past that has become steeped into our foundation myths, yet we don’t know much about them past the narratives we were all given as school children. And that’s on both sides of the conflict. How many people know there’s a statue of George Washington, in London, of all places? Right across from Big Ben. I understand you have family who are re-enactors – ever taken part yourself? Ha! That’s a funny story. I love history, and I have no problem showing up to a re-enactment to watch. But I prefer WIFI and showers and not having to churn your own butter and bake your own bread at 3 am so you have something to eat before drill at 6. I respect my family for doing it, and for doing it exceptionally well, I might add. But the only time I’ve ever attempted to participate in a re-enactment was when I formally asked my father-in-law for his daughter’s hand. Please keep in mind, he had a firearm in his hands when I asked. Tell me a little about the cover design process – was it smooth? How did you come up with the final cover? The cover process is just like any artistic endeavor – there’s research and idea gathering, and mock-ups, and revisions. In this case, a picture of a cannon I had provided to the publisher as inspiration turned out to be anachronistic to the period. It was greatly disappointing because the cover was truly phenomenal. It sent us back to the drawing board and I essentially asked, what if we could have exactly what we wanted? And the answer to that was to find an illustrator with the talent to draw exactly what was needed. What we got was a fantastic rendering of George Washington wearing a British uniform. What’s interesting about it, is there are no forward-facing portraits of Washington – he’s always painted at an angle. So, our illustrator had to create Washington’s face from the ground up, based off all these other angled images. He did a great job. Who’s the artist for that portrait of Washington? Where did you find the artist to commission? The talented Ian Bristow illustrated the portrait, and the publisher put together the cover. Ian’s also a writer too, so go stop what you’re doing to go Google his name and grab his books. As far as finding talent, well that’s easy. I belong to a group of Science Fiction writers, The Knights of the Roundtable. If you write SF, you really should join. They are the best, most talented, most professional people I know. I’m proud to be a member. Is there a particular scene you’re proud of? And what is it about that scene that makes you feel that way about it? I can’t give it away without spoilers, but what helped me drive through this book was the excitement and anticipation at writing a certain showdown. I looked forward to it forever and when I finally got to do it, I ended up writing several scenes, just to see what worked best and how the two characters would respond to different lines. It was almost akin to being a director and having two awesome actors to feed lines and have them play off each other. I just sat back and let the two characters write the scene for me. It was fun. There’s a sequel under way, right? Right? Alright! Alright! I have book two in the works, just get me a typewriter and some ice! Okay, before we round off, remind us where readers can keep up with your work. Easiest way is to swing by www.brentaharris.com and from there, you can taunt me on Twitter, or Facebook. The choice is yours. Easy! And lastly, you know the drill around here – what’s your favourite book that you’ve read in the past year and what are you reading right now? I’ve been reading so many fantastic books lately. Best of the year so far is Ernest Hemingway’s A Moveable Feast. My favorite short story I’ve rediscovered has been GRRM’s A Song for Lya. I’m reading Heinlein’s Have Space-Suit Will Travel, but I’m reading around right now so I also have been seeing the essayist Joan Didion. On the Indy scene, I’m finishing up the first Felix Fox novel—Assaph Mehr’s wonderful Murder in Absentia. Along the same vein, I’ve been enjoying E.M. Swift-Hook and Jane Jago’s Dying to Be Roman series, and several other SF Roundtable novels that are in various ‘percentage read’ states on my Kindle. I’ll get to them all eventually. Brent, congratulations on the book, I hope it does very well for you. Thanks for calling by.